There is no denying that Glock pistols dominate the polymer pistol market in the U.S. The company offers its legions of loyal customers a variety of reliable compact and service size handguns in popular calibers such as the 9mm Parabellum, 40 S&W, and 45ACP. However, I am one of those few people who don’t like Glocks for one simple reason: they do not fit my hand well. They ride too low in the hand, and the back straps contact the palm of my hand in such a way that it does not make for a comfortable grip, and the muzzle tends to point skyward when bringing the gun on target. This requires me to slightly drop my wrist to align the sights. From what I have read and heard, this is not an uncommon problem for people like me who are accustomed to the grip angle of the Model 1911 series of pistols. However, I found a high quality German-made alternative to the Glock that is every bit as well made and reliable, plus incorporates a number of features not found on the Austrian handguns. The Walther P99 is a striker-fired pistol with a Tennifer finish and comes with three interchangeable back straps that allow the shooter to custom fit the weapon to his or her hand for maximum comfort. The first time I held the P99, I immediately was impressed with its comfortable grip and balance. It felt natural in my hand and it pointed well. It has safety features such as a loaded chamber and cocking indicator and a flush mounted de-cocker button in the top of the slide (of course the most important safety feature rests between one’s ears), ambidextrous magazine release, light rail, four interchangeable front sights, 2-10 round magazines and a unique double/single action trigger capability. The DA mode is a little long and creeping but not displeasing to me. A feature I like is the ability to change from the DA trigger mode to SA by simply pulling the slide rearward about 3/8 of an inch and it sets the trigger for a light SA trigger pull. The weapon can be safely carried in this single action mode as well. I have found my particular pistol, which is chambered for 9mm, to be very reliable and accurate. I have fired over 500 rounds consisting of 125 gr. lead RN reloads, 115gr and 124gr FMJ, and a variety of standard pressure hollow-point ammo in 115, 124, and 135 weights without a single stoppage. I have yet to try any of the +P loads but have no doubt the P99 would handle them without difficulty. Though I have never been a great fan of the 9mm, it is easy to shoot and ammunition is inexpensive and plentiful. This permits more practice, which translates into increased proficiency. Should Walther ever decide to produce the P99 in 45ACP, I would definitely procure one. For a weapon that is classified as service size, it is relatively compact and conceals quite easily. So if Glock pistols don’t appeal to you, seriously consider the P99. If you want more power than the 9mm, the P99 is also chambered for 40 S&W. It is an excellent handgun that has not been aggressively marketed in this country. However Smith &Wesson and Walther are jointly manufacturing the SW99 that has all the same features as the P99 but with some minor cosmetic changes. I presume this version will be marketed by S&W with more zeal than Walther has done with the P99. 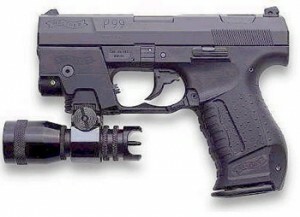 If you wish to check out the P99, visit the Walther website at www.waltheramerica.com. It is a fine handgun worthy of the attention of those seeking a top notch defensive weapon.